The Magic Cafe Forums - Envelopes with panoramic window. Other than making them myself and Etsy, does anyone know of a supplier of small envelopes for a playing card, with a panoramic window, and the opening on the short side? (see pic example) Many thanks. Here are some A7 size that I wonder if you could cut in half to make two out of one. That would also change the opening to be on the short side. An alternate way to look at it would be to start with a cellophane or transparent envelope to begin with and paint the outside edges opaque, then insert a piece of paper or cardboard to act as a background. Here is a link to an Australian site that produces what you are after. 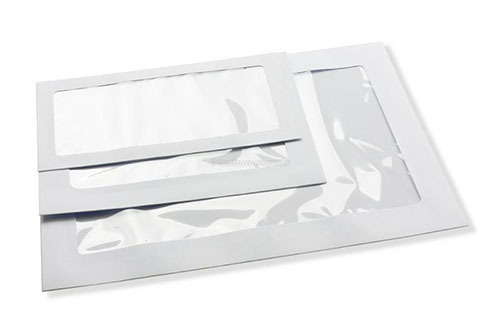 Pocket Envelope with a window. Can't tell you prices but it may be worth a look.